In every age, Christians experience pressure to embrace contemporary culture. In Corinth, the church had been infiltrated by some who had grown weary of the message of the cross: whose boast was in outward appearance. In 2 Corinthians 2-7,Paul writes into this setting, urging the Corinthians then, and us today, to embrace the 'weak' ministry of Gospel proclamation, to partner with 'weak' Christians, and to boast in 'weak' ministers. It is in this weakness that God's power is exhibited. 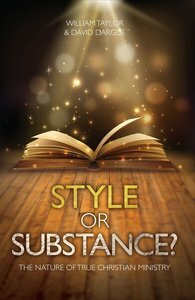 Nothing could be more opposite to our celebrity culture..
About "Style Or Substance? the Nature of True Christian Ministry"
William Taylor is the minister of St. Helens, Bishopsgate, London. Previously he was an officer in the Royal Green Jackets. He is the author of Partnership Concise, portable spiritual food - Philippians and Understanding the Times : Living in the Light of the Arrival of the King.